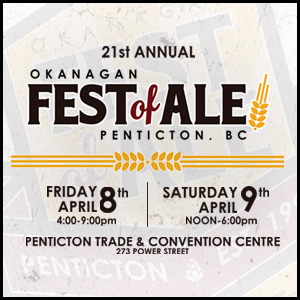 A record number of craft brewers & cider makers will be heading to Penticton April 8 & 9 to showcase their best at the 21st annual Okanagan Fest of Ale. The list of those list participating tops 50 and includes 46 craft breweries and 5 amazing cideries. 13 of the participants are new to the event…one of which has yet to open its doors. Guests of the fest will have the opportunity to choose from 150+ of of the most flavourful lagers, stouts, ciders and cask ales. Check out the list of participating brewers below and visit the Craft Brewers gallery at www.FestofAle.ca to find listings of the products each brewer will be showcasing at the event (updates are being made regularly) and then make plans to Sip, Savour & Celebrate with your favourite craft brewers at the 2016 Fest of Ale!